Contact wcwcatholic@gmail.com with your name, the name you are choosing for your spiritually adopted baby and your email address to participate. We will add the baby's name to the list below and send you reminder updates once a month. 3. The Present Party - After nine months it is nice to have a baby shower or other closing for the program to celebrate the "births". Gifts can be donated to a local crisis pregnancy center. Close-up of Little One Sweet painting for month 3. Copywrite Linda Brenegan. Used with permission. "Loving God, you created us in your own image. Protect the beautiful child, ______________, for whom I pray. May he/she remain in good health and may his/her mother and father have the support they need to nurture the life given to them. In the name of Jesus, born of Mary, we pray. Amen." Jesus, Mary and Joseph, I love you very much. I beg you to protect each baby in its mother’s womb. Please give the parents of these children the help they need to keep their babies strong and healthy. Amen. 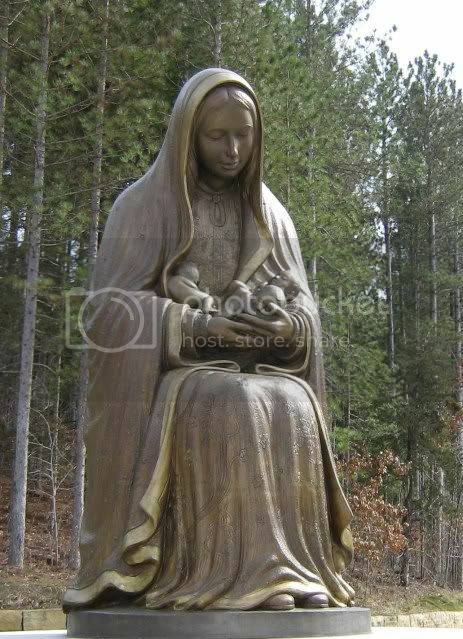 O my Jesus, by the intercession of Mary, your Mother, who bore you so lovingly, and of St. Joseph, strong man of faith who protected you both, I pray to You for the life of ______________, the unborn child I have spiritually adopted who is in danger of abortion. Please give to the parents of this child the grace and the courage to bring him/her to birth and to the life you have planned for __________________. If you would like to spiritually adopt a baby but your church does not have a program, you can participate on-line here at WCWCatholic. At WCWCatholic we start every year on the Feast of the Annunciation, March 25, and watch our babies develop in the womb along with Our Lord for a Christmas birth celebration. We will send an email reminder to keep up those daily prayers and a link updating the baby's physical development each month. Send in the name of your spiritually adopted baby and we will publish it in the list below. Others who catch us mid-year may want to pray for your named baby for the remainder of the year before naming their own baby in the future. You do NOT have to be from Wisconsin or Catholic to participate in our On-line Spiritual Adoption and any age can make the pledge. Send the name you gave your baby to wcwcatholic@gmail.com. This is, of course, totally free and your email address will not be used for any other purpose. In 2010, my 14 year old daughter decided to spiritually adopt a baby and she has named her "Bernadette", after her favorite saint. I put the name on the list below. She prayed daily for baby Bernadette from Annunciation to Christmas 2010 and she was able to watch the baby develop through WCWCatholic's monthly email update. Here are the monthly growth pictures from the Little One Sweet Posters in case you can't wait to see them. In researching this spiritual adoption page I made a call to the Respect Life Program office of the Archdiocese of Baltimore and found myself talking to its director, Linda Brenegan. She told me the story of how the Little One Sweet posters came to be. Apparently, back in 2001 she was working hard to get the spiritual adoption program established for the archdiocese and tried to find someone to paint the illustrations for a series of prenatal posters. None of the artists she knew was willing or able to take it on. In desperation, for the sake of the program, Linda set out to do it herself. An amateur painter, she had done a few commissioned portraits before but it was always a slow process, taking about six months for each work. She needed to get THIRTEEN paintings done in a short time . . . and don't forget her fulltime day job at the archdiocese. 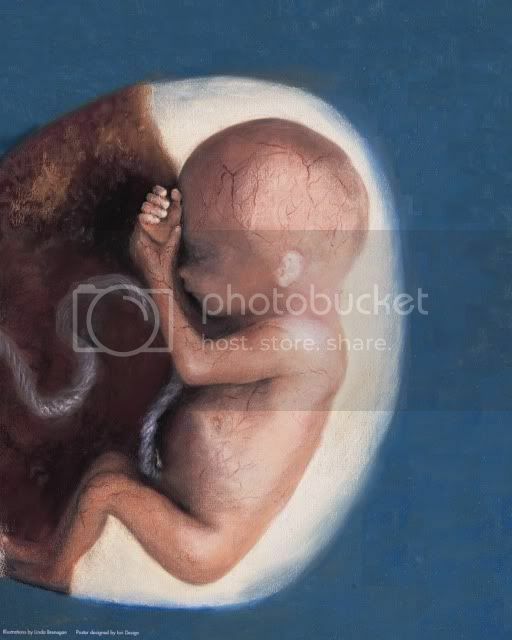 She gathered some photographs to use as models for her paintings and she tells me with grief that from what she knows about the picture source, most of the babies were probably aborted unless God moved to prevent that in a way she was unaware of. Believing that the babies were with Our Lord now, she prayed to each one as she worked that they would ask God to help her paint them as beautiful as God made them so that everyone who saw their “portrait” would be moved to tenderness for the child in the womb. Like the elves and the shoemaker story, each morning she would come downstairs and be amazed that she had made so much progress the previous night. She giggled when she noticed afterwards that from the time she started working on the paintings to the printing of the posters exactly NINE MONTHS had passed! To Brenegan's amazement, since 2001 over 10,000 Little Sweet One poster sets have been sold - just in English! They also were originally made in Spanish. At an interview once about the posters she found herself making the offer of providing them in any language requested. Shortly thereafter she received a call requesting them in LATVIAN. Again, to Brenegan's surprise, the Lord quickly provided a Latvian translator. The posters are now in use worldwide in eight languages for spiritual adoption programs and for general education. And if you need one in Swahili . . . Brenegan has you covered. Article photo above is of Brenegan and her husband presenting a set of the posters in Polish in 2003 to Pope JPII in Rome. She says "He smiled broadly and seemed very pleased!" The posters were for Poland as a gift to His Holiness for his birthday. Photo courtesy of Linda Brenegan.